Teething necklace for Mom!! Our teething necklace is a great way to entertain your babies while nursing , baby wearing or teething. 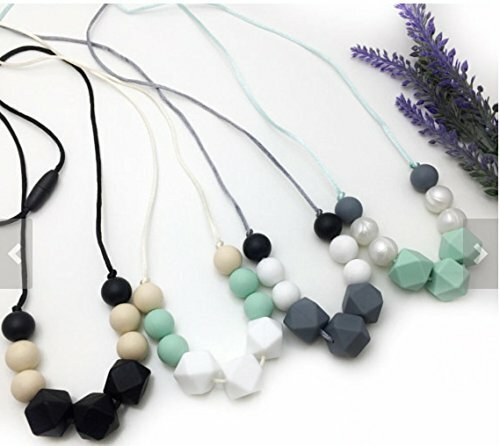 This chew necklace for Mom is made with hexagon silicone beads giving your baby many surfaces to chew one, making the perfect accessory for Mom! ♥︎ Total drop length is approximately 16". ♥︎ Best quality food grade silicone: BPA FREE, phthalates FREE, cadmium FREE, lead and heavy metals FREE. FDA approved, CPSC compliant. NO smell, NO taste. ♥︎ Nursing necklaces are a great sensory tool to help babies focus while feeding, Yay! No more pinching! ♥︎ Cord is exposed in the back so rest assured there will be no hair pulling! ♥︎ Gummy Chic chew necklaces have a breakaway clasp for those little hands that like to pull. These silicone necklaces won't break, but simply just snap off your neck if pulled too hard. If you have any questions about this product by Gummy Chic, contact us by completing and submitting the form below. If you are looking for a specif part number, please include it with your message.